A breach of a contract in legal terms is the amounts to a broken promise to do or not do an act. Breach of a contract means failing to perform any term of a contract without a legitimate legal excuse or reason. The contract may be either written or oral. A breach may include various factors like: – Not finishing a job. – Failure to make full payment or not on time. – Failure to deliver all the goods. – Substituting inferior or significantly different goods. – Not insuring goods. An anticipatory breach may be made by an act which indicates the party will not complete the work. A breach of a contract in legal terms is the amounts to a broken promise to do or not do an act. Breaches of a contract are single, occurring at a single point in time, or continuing breaches. A lawsuit for breach of contract is a civil action and the remedies awarded are designed to place the affected party in the position they would be in if not for the breach. 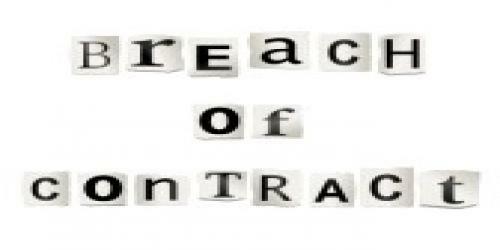 Remedies for contractual breaches are not designed to punish the breaching party. A contract is a legally enforceable promise that is made in writing or orally. However, certain promises must be reduced to writing in order to satisfy the Statute of Frauds, a rule of substantive law, not a rule of evidence that specifies certain subjects that must be evidenced by a written instrument. The non-breaching party is relieved of his obligations under the contract by the other party's breach. Courts will award damages in the event of a breach, but the intent is not to punish the breaching party, but to put the other party in such a position that they would occupy if the contract had been fulfilled. In cases where money is inadequate to compensate the aggrieved party, the court may award specific performance to force the breaching party to fulfill the terms of the contract.